I'm just popping in for a quick minute to show you a finished project that was in the works for about two and a half years! Man, how time flies! Many moons ago, I won a giveaway on Instagram from Sam (@paeoniasfz). She sent me a bundle of 16 Michael Miller Brambleberry Ridge (by Violet Craft) fat eighths. They were darling and I was thrilled. It's not every day that I win a giveaway! 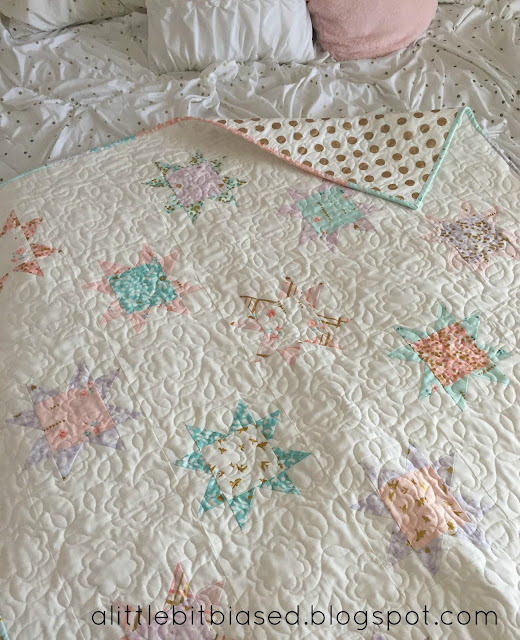 I worked on these little 8" finished stars a little here and a little there over the years (can't believe I'm saying that!) and finally, a few days before the end of 2016, I got some motivation to finish the quilt top! I just finished the binding last night and couldn't wait to show you guys! These soft colors have my heart. I was a little worried about adding the 8" white filler blocks in-between the star blocks. I thought it might be too much white/blank space but I actually love the simplicity of it! Do you like "white" space? I think it's a great place to show off some quilting. 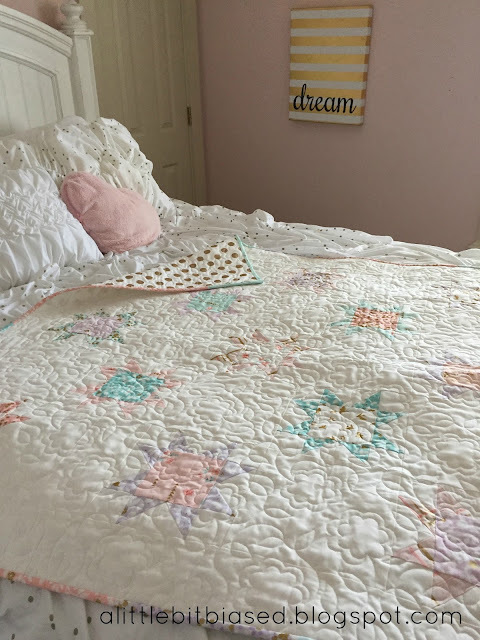 Speaking of which, the simple floral/leaf quilting was done by my friend Cathy Barney. She did a great job, as always! I wanted to use as much fabric as I could from those cute fat eighths so I made a scrappy binding. I love scrappy bindings, don't you? 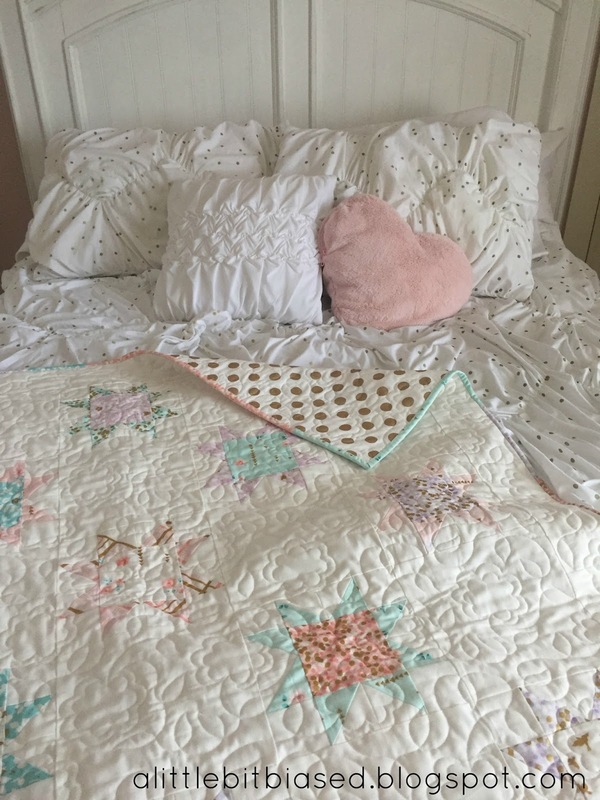 I think they work especially well when the quilt top isn't too busy. The gold polka dot backing fabric is also from Michael Miller. I got it recently and was excited that it was such a perfect match! Well, that's it for now. I'm off to run a couple errands and then sew for a few hours (at a friend's house) on February's Five Fat Quarter Fun project. It's going to be really cute. Can't wait to show you come February 1st! It's time for round 2 of Five Fat Quarter Fun! Amanda (@jedicraftgirl) and I are having so much fun creating projects that use just 5 fat quarters (plus maybe a little yardage). These patterns are free, quick and lots of fun to make! We hope to keep this up for a whole year and we have some exciting things planned so we hope you'll stay tuned! 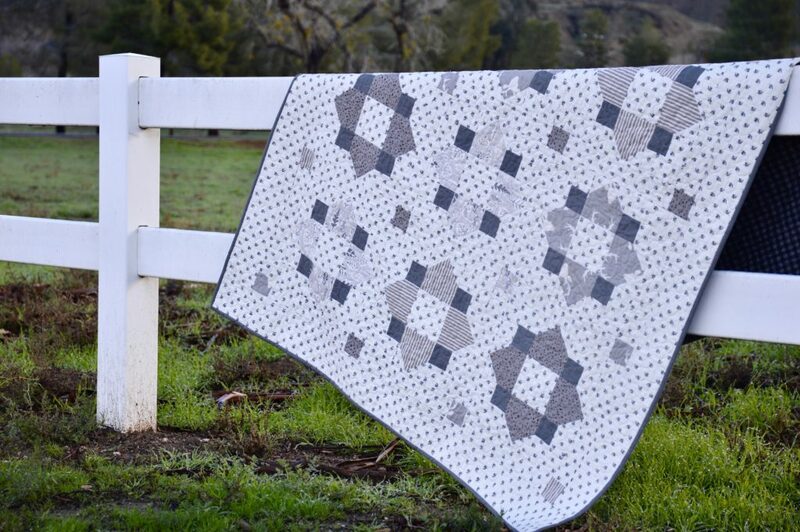 This lap size quilt was inspired by simple snowflakes so I chose 5 wintry fat quarters that I had in my stash. Of course, these blocks are generic enough for any color/themed fabrics so go ahead and do your fabric pull! 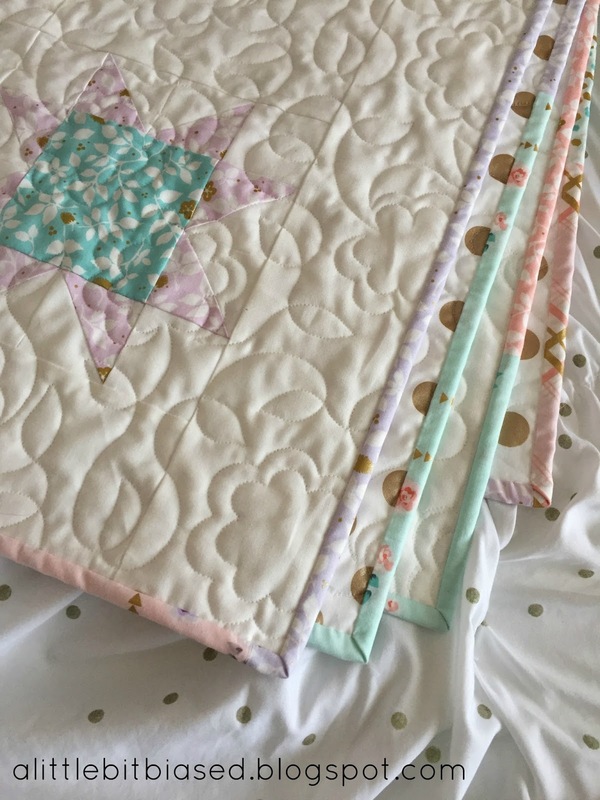 When it came to finishing this quilt, I found the deer silhouette fabric in my stash but I only had a yard - which was not enough! But you know when you find something you just fall in love with - you just have to have it! Unfortunately, I was on a super tight deadline so I could get this pattern to you this month, so I didn't have time to search around and/or order it online. But I decided to try just one local quilt shop (that I knew carried some Art Gallery fabrics) to see if they just might have it. And guess what! They had exactly the amount I needed so I took it all! It was perfect! Then, a few days later I had a similar experience with the binding fabric! I had enough of the grey/black dot fabric in my stash to bind it with but my heart was really set on using the red plaid. Again, I didn't really have time to search around for it and I knew it had been in quilt shops for a several months so my chances of finding it were slim but I decided that I would try just one quilt shop (a differrent one, that I knew carried a lot of Moda fabrics). I walked into the shop, the woman working there asked me if I was looking for anything particular, I described the plaid, she walked right over to it and I about died! I couldn't believe my luck! Cathy Barney quilted it for me using a pattern called "Even Simpler Cable" by Legacy Quilting. It matches the light red fabric really well and I loved the knit sweater vibe it gave so it was a no-brainer choice for quilting! This winter has been mild for us (which is weird because we're right at the base of these mountains here in Utah) but I felt like it was fitting to bind and photograph this quilt on this beautiful, snowy day. I love the snow! If you'd like to get this FREE pattern, click HERE. 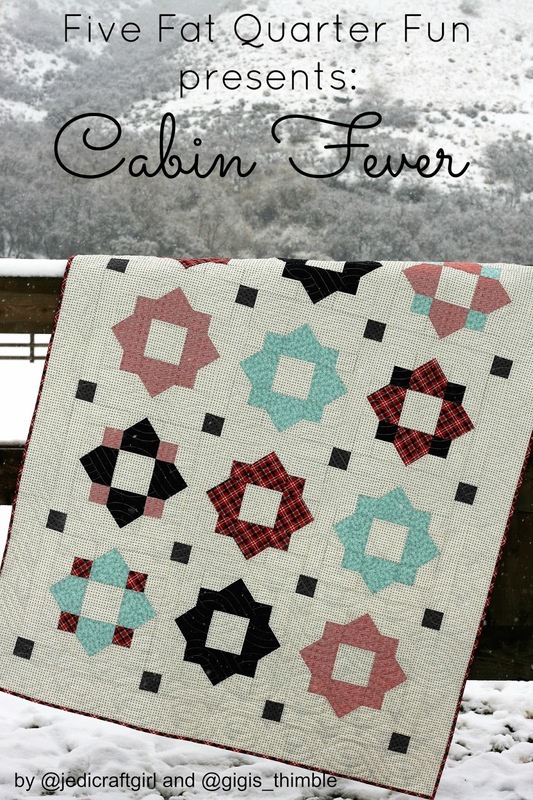 Be sure to stop by Amanda's blog, Jedi Craft Girl, to read all about her neutral farmhouse version of Cabin Fever. It's darling and her living room & dining room are too!!! And if you're on Instagram be sure to tag Amanda and I at @jedicraftgirl and @gigis_thimble. We'd love to see your versions of any of our Five Fat Quarter Fun projects! Be sure to use the hashtag #fivefatquarterfun.